You serve and protect this country and for that you need a reliable and worthy watch for your hand. Not just any old watch with features like waterproof or alarm clock. No, You deserve the very best military watch that you can find. The watch that you choose should have all the features that you need a watch to have on the battlefield. The military has created a MIL-SPEC specification on how a military watch should be made for analog watches, but there is no such thing for digital watches. That is why when choosing a digital military watch you need to be careful in deciding which one you will go with. On the other hand if you are here for a more fashion trendy military watch in the luxury spectrum that you can check out my other article right here. Men wearing a suit and tie and attending a formal business meeting do not have the same needs as you.You are a military man that needs a watch that can keep you on track,be stealthy, and last in various environments without any sign of wear.A military watch has all these features and more.There are different types of military watches and they each have their own extra set of specific set of features.Below I have listed some features that make a military watch “military” capable. Reverse/ Inverse LCD screen for stealth – The background of the screen is black and the digits are in a lighter color. Titanium or Carbon Fiber case –Cases made from these materials are light weight and durable at the same time. At least 100M Water resistance –If you are going on underwater expeditions but It is mainly useful for navy seals. Solar Powered or Easy to change battery-What good is the watch if you cannot power it and in the field your options are limited. Large form factor Watch-This is needed because with gloves on small watches will not do. Quick Global silent setting- This would be a very useful feature which is unfortunately not available on any watch as of now. This type of military watch is issued to infantry or other ground units and are often designed to be cheap and rugged at the same time. They are meant to be low price, low maintenance, mass deployment watches. Its main purpose is to provide a synchronized time which is much needed accuracy in the timing of maneuvers, from the front lines to the control center. There are so many different watches in this category to choose from. When the military takes to the sky, timing is everything. Whether, clocking a bomb run, delivering troops to a specific location at a precise time or navigating by time and heading, a reliable and accurate timepiece is needed. In general, these watches feature more accurate movements and larger dials than their land-based counterparts and are worn by pilots and other aircrew. Pilot watches also come with their own special set of features which include a chronograph for measuring time, a highly legible dial for high readability in the vibration of an aircraft and a tachymeter for performing speed/distance calculations. This type of watch is highly collectable with classic brands such as Heuer, IWC, A Lange & Sohne ,LeCoultre ,Omega, , Jaeger, and Hamilton having made great examples of this style of watch. Diving watches need to be well built and they are just that. They’re the most robust – and often most expensive – military timepieces which includes models built by famed watch brands like Rolex, Omega, Tudor, Blancpain, and Eterna. Military dive watches are found on the wrists of some of the most top class members of the military, including naval special operations forces and clearance divers. Top quality construction and relative scarcity drive the value of these watches higher than all most any other military watch .There are many collectors who count this type of watch among their favorites. Fortunately, for those people who don’t have y thousands of dollars to spend on a watch, more affordable diving watches exist as well. Considering the technological advances introduced in military dive watches, owning one of these watches often means owning a piece of watchmaking history. The Suunto Core is one of the most fully featured military watches available. It has a multitude of features including an altimeter, barometer, compass, storm indicator and a weather trend indicator, which would serve all the needs you would have outdoors. This watch is made in three style ranges: Suunto Core Premium, Suunto Core Classic, Suunto Core Crush. These ranges all have a wide range of color palettes, which gives you a combinations to pick from. All these features and options combines to make this watch our top military watch choice. The Casio Pro Tek PRW2500 is a high performance watch designed to take on challenging environments .It features an easy one touch operation for using the Altimeter /Barometer, compass and the thermometer. It is designed with a dual lcd display layout that can easily provide information at a glance. This watch includes information like the tide and the moon making it very convenient when fishing or boating. It has atomic timekeeping via time calibration radio signals, which means the time is precisely reported. This watch is part of the Origin and Master series in the G –Shock line. It embodies the style of G-shocks classic, popular watches combined with the ruggedness and style of a military watch. This watch is perfect for people on a budget. It comes in fewer styles than the Sunto Core Watch but it has different versions with different dials and fixed colors.. Unlike the other watches on this list it does not have much extra features making this more suitable for someone looking for a military inspired watch. It excels in its ruggedness and durability, which G-Shock excels in its price class. Traser was the military’s contract for making military watches back in the day. This particular military watch is the only one on the list that is officially MIL- Spec certified, meaning it is made to how the military dictates a military watch should be made. It features a unique illumination system named trigalight that is an independent lighting for the watch face from the battery. It uses tritium gas and radioactive decay to power it for 10 years. It features a scratch resistant dome of mineral crystals that shields the watch face that matches the military standard. The only minor thing that could bother you in the future is that to replace the battery you have to go to a Traser warranty center. 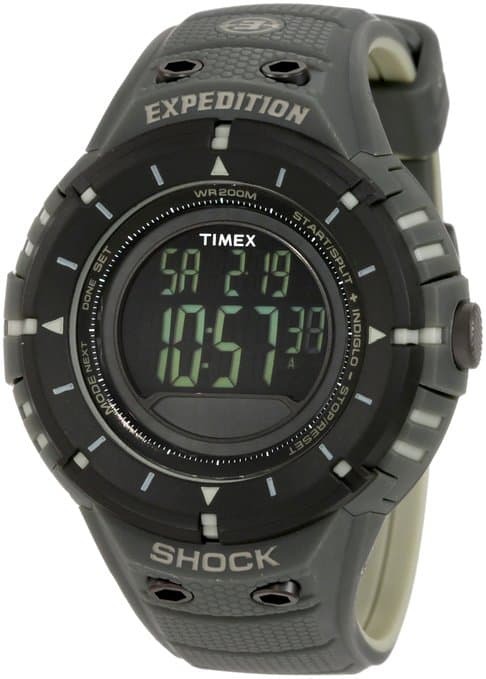 This watch was made primarily for outdoorsy people and it is part of the Timex Trail Series. 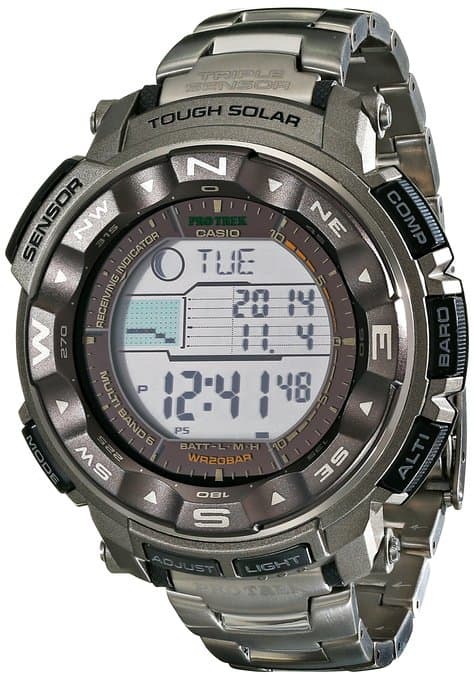 It features a digital compass in addition to the standard watch features. It is really rugged and lightweight and shock proof up to ISO standards. It would work for military members who are looking for a watch primarily for keeping time and not with any extra features. However, it is still a great budget watch. Overall I would like to conclude by saying that my choice for the best military watch will be different then your choice , but that is why I have created this guide and added a comparison chart with my top picks for you to make a more informed decision.In my personal opionion I would say that the Suunto Core military watch fits most of the criteria I have set above and so I have picked this as my first choice.This does not mean that the other watches are inferior but it best fits what I am looking for in a military watch.